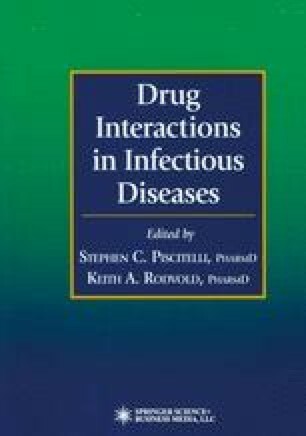 As outlined in Chapter 3, drug interactions in HIV are encountered frequently, particularly with protease inhibitors and non-nucleoside reverse transcriptase inhibitors (NNRTIs). In a retrospective chart review of 165 HIV patients newly prescribed a protease inhibitor, at least one potential drug interaction was identified in 82 (49.7%) patients (1). In total, 111 interactions were identified, but only 22 (19.8%) were recognized at the time of protease inhibitor therapy initiation. An additional 12 drug interactions were later identified at follow-up, but 77 (69.3%) were never recognized. At the time this study was conducted, only three protease inhibitors (saquinavir, ritonavir, and indinavir) were available. With even more agents and drug classes available today, the potential for interactions is likely much higher.